I realize I haven’t updated in awhile so heres whats going on. Been on a on and off streak lately since I had some things going on and some things to figure out. I haven’t worked on the short anymore yet since I’m figuring out how I want to do certain things. The last thing I was working on for it was the modeling, which I’m trying to do in maya but like I’m sure others do have problems getting what I want since modeling in Maya is a bit of a pain. I’m still gonna try between that and modeling what I need in Modo, so that will be a whooping 2 programs to learn on this project so far. However right now I’ve been going back and revisiting an old project I had started probably a little over 2 years ago now, which is a WWII Memorial piece of the Battle of the Buldge. I got the inspiration for this while doing some image searching on google while being really into Band of Brother (both the book and HBO miniseries), I had found an image that spoke to me in a way and I got some inspiration for it. 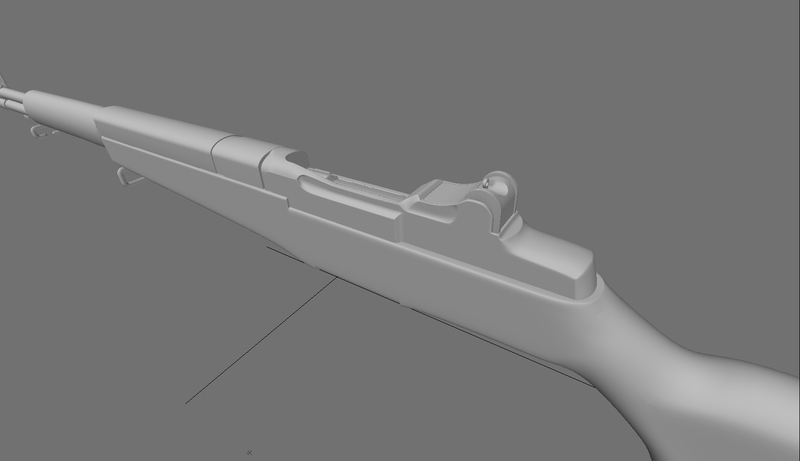 Currently right now I’m remodeling the M1 Garand model I had made to be more accurate since I made some parts inaccurately before when I originally modeled it. One new program I’m going to learn for this project is ZBrush which I plan to do the snowy terrain and possibly add some details to a few things. One other thing I’m going to look at doing to keep myself motivated is to see about getting involved in some sort of fanfilm project, but I’m going to try and not let that take away from my own projects. Hey Everyone, welcome to my new blog setup, which will be seconday from my main site. Right now I’m going through Jason Ryan Animation to make sure I keep up with the basics and do some tests beofre I do an animation that I have planned, Gotta learn to jump over a puddle before I jump a lake. As I get tests done I’ll post them up so you can see my progression which you can feel free to comments on, it’s the only way I’ll get better. Also I’ll be posting up some work thats unfinished or for some other reason is not up on my main site, expect to start seeing some of that soon.